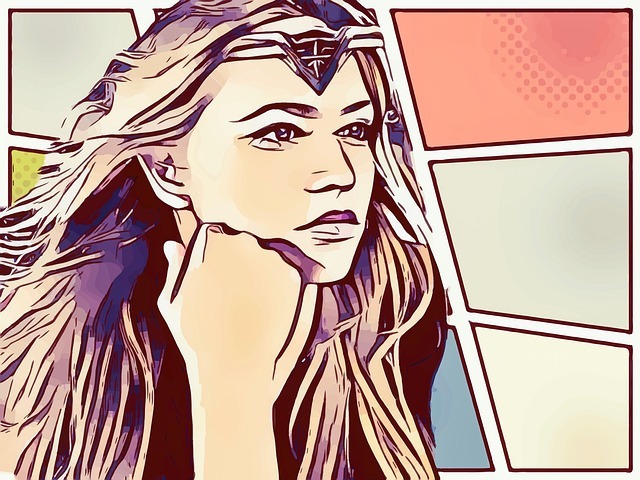 From the decades long comic book started by William Moulton Marston to the 2017 movie starring Gal Gadot and directed by Patty Jenkins, the DC superhero Wonder Woman has been an icon for equality and love over hate across generations. Standing shoulder to shoulder with fellow DC heroes Superman and Batman, Princess Diana of Themyscria has been the heart of the Justice League and the DC Universe as a whole. The Wonder Woman quotes shown here represent a character rich with a history of strength, poise, character, and intelligence that has inspired generations of girls and boys. I will fight — for those who cannot fight for themselves. I used to want to save the world. To end war and bring peace to mankind; but then I glimpsed the darkness that lives within their light. I learnt that inside every one of them there will always be both. The choice each must make for themselves — something no hero will ever defeat. And now I know… that only Love can truly save the world. So now I stay, I fight, and I give — for the world I know can be. This is my mission now. Forever. I have no father. I was brought to life by Zeus. Umm, they have breakfast. They love their breakfast. And, umm, they love to wake up and read the paper and go to work, they get married, make some babies, grow up together. I guess. When it comes to procreation, men are essential, but for pleasure, not necessary. I am both frightened… and aroused. The stronger she gets, the sooner he will find her. They came to the conclusion that men are essential for procreation, but when it comes to pleasure, unnecessary. If he dies, we know nothing about who they are and why they came. Never let your guard down. 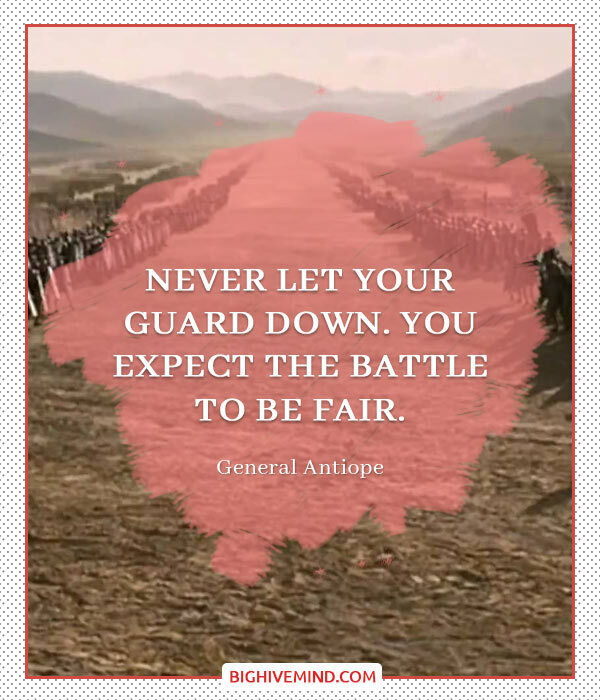 You expect the battle to be fair. I love fire, don’t you? It is like a living act of entropy. The ultimate weapon of destruction. Reminding us that in the end everything eventually returns to the ash it came from. My name is Captain Steve Trevor, pilot, American Expeditionary Forces. Serial number 8141921. Assigned to British Intelligence. She was right. My mother was right. She said the world of men do not deserve you. They don’t deserve our help. It is our sacred duty to defend the world and it is what I am going to do. 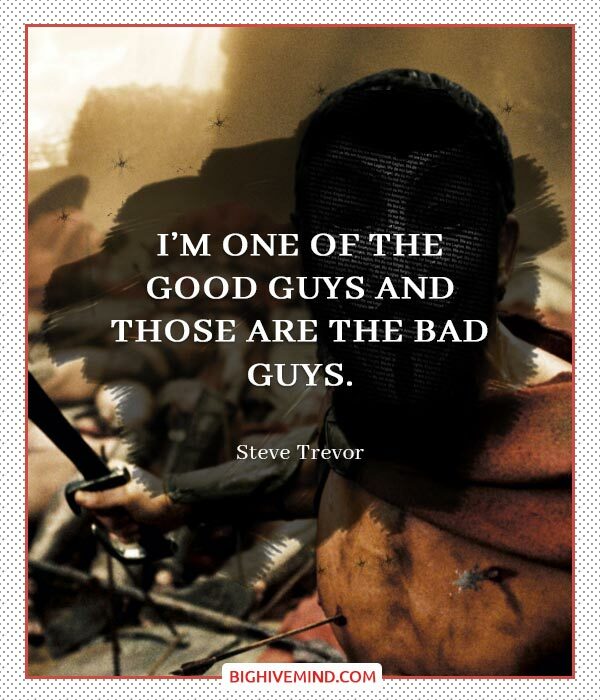 I’m one of the good guys and those are the bad guys. You will train her harder than any Amazon before her, five times harder, ten times harder, until she is better than even you. But she must never know the truth about what she is. It has to be me. I can save today. You can save the world. … I wish we had more time. Diana, fighting does not make you a hero. This is no man’s land, Diana! It means no man can cross it, alright? This battalion has been here for nearly a year and they’ve barely gained an inch. All right? Because on the other side there are a bunch of Germans pointing machine guns at every square inch of this place. This is not something you can cross. It’s not possible. You are stronger than you believe. I am going, mother. I cannot stand by while innocent lives are lost. If no one else will defend the world from Ares, then I must. I have to go. How can you fight in this outfit? Fight? We use our principles. Although I am not opposed to engaging in a bit of fisticuffs should the occasion rise. The gods gave us many gifts. One day you’ll know them all. This is where we keep them. Wonder Woman is not relying on a man, and she’s not there because of a love story. She’s not there to serve someone else. I cannot stand by while innocent lives are lost! We speak hundreds of languages. We are the bridge to a greater understanding between all men. It’s… it’s not about deserve. Maybe, maybe we don’t. But it’s not about that, it’s about what you believe. You don’t think I get it, after what I’ve seen out there? You don’t think I wish I could tell you that it was one bad guy to blame? It’s not! We’re all to blame! She was right, my mother was right… she said the world of men do not deserve you, they don’t deserve our help. Where I come from generals don’t hide in their offices. They stand beside their soldiers. They die with their soldiers. The sword doesn’t go with the outfit. I was there to observe and report. But I had to do something. I go where he tells me to go, I do what he tells me to do. The gods made the Amazons to restore peace to the world, and it’s what I’m going to do. I am not the god of war, Diana. I am the god of truth! Really, specs? And suddenly she’s not the most beautiful woman you’ve ever seen? No — we are doing something. We are! We just … we can’t save everyone in this war. This is not what we came here to do. I used to want to save the world, this beautiful place. But I knew so little then. It is a land of magic and wonder, worth cherishing in every way. But the closer you get the more you see the great darkness shimmering within. And mankind, mankind is another story altogether. What one does when faced with the truth is more difficult than you think. I learned this the hard way, a long, long time ago. And now I will never be the same. Where we come from, that’s called slavery. I am a… I am a… I’m a spy! I’m a spy. I’m a spy. What one does with the truth is more difficult than you think. I learnt this the hard way, a long, long time ago. And now, my life will never be the same. You have been my greatest love. Today you become my greatest sorrow. Be careful, Diana. They do not deserve you. Only the fiercest among us even could, and that is not you, Diana. Is this what people do when there are no wars to fight? No! After everything I saw it can’t be. It cannot be! They were killing each other. Killing people they cannot see. Children. Children! No, it had to be him, it cannot be them. They don’t deserve your protection! The war to end all wars! Weapons far deadlier than you can imagine. Whoever you are, you are in more danger than you realize! I wish we had more time. I love you. Hippolyta, I love her as you do. But this is the only way to truly protect her. I know. Or at least I know I cannot stop you. There is so much, so much you do not understand. Ares is alive. You feel it as I do, in your bones. It is only a matter of time before he returns. Diana, you are the most precious thing in the world to me. I wished for you so much, so I sculpted you from clay myself and begged Zeus to give you life. Be careful of mankind, Diana. They do not deserve you. Technically, the war is that way. But first we got to go THIS way. The Lasso of Hestia compels you to reveal the truth. I understand enough. But I’m willing to fight for those who cannot fight for themselves. Like you once did.